As western authors and publishers we are often so wrapped up in the day to day struggle to make an impact in the world’s biggest and (for us) most convenient book market, the USA, that we all but lose sight of the bigger picture: the flourishing global market for books. As this is New Year’s Eve I’ll keep this post light and fluffy, picking out just twelve (of countless) international book and publishing stories that will give you at least a flavor of how the Global New Renaissance is shaping up as this decade enters its twilight years. Let’s start with the July 2017 opening of the world’s biggest bookstore. But hold on you say, wasn’t the world’s biggest bookstore opened back late last century? The fabled Barnes & Noble megastore in New York? Well, it is still the record-holder according to the Guinness World Records, the website of which states. The largest individual bookstore in the world measured by square footage is the Barnes Noble Bookstore at 105 Fifth Ave at 18th Street, New York City, USA. It covers 154,250ft² and has 12.87 miles of shelving. Now far be it from me to suggest the Guinness site may be out of date but, well, the Guinness site seems to be out of date. Because back in July of this year an even bigger bookstore opened. The Book Garden. As Newsweek reported at the time, the new store dwarfs the Barnes & Noble store – compare B&N’s 154,000ft² to The Book Garden’s 700,000ft². And that’s just inside, not including the extensive grounds, and artificial lake to make the visit even more enjoyable. Oh, and did I mention the rooftop reading gardens too? 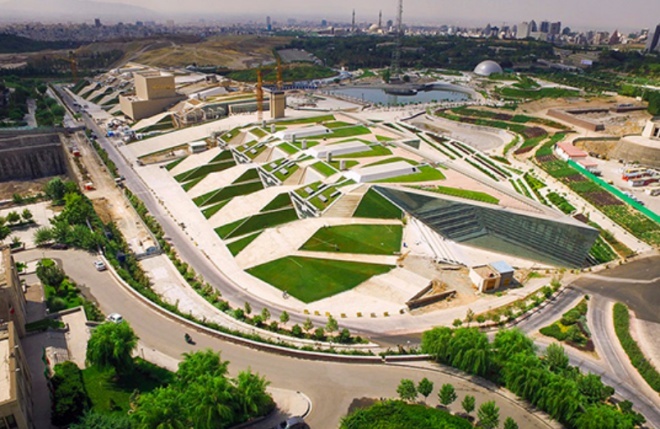 Teheran Book Garden – the world’s largest book store. Check out this architecture site for some stunning photos and even, if it rocks your boat, the architectural plans for The Book Garden. It’s not just books – there are several cinemas, science rooms, restaurants and a host of other goodies to keep visitors enthralled. Yes, that Teheran. The biggest bookstore in the word is in Iran. No, don’t be so surprised. Iran’s International Book Fair attracts over two million visitors each year. It wasn’t just Iran that saw two million visitors turning out for a book fair. Two million visitors is typical of a number of countries many of us in our sheltered western existence might have thought didn’t even know what books were. Nations as improbable as Malaysia, Thailand, Egypt and India, to name but a few, regularly clock over two million visitors to book fairs, and books to the value of hundreds of millions of dollars are sold at these events, mostly untracked by the stats-counters that tell us which countries are players in the international book markets. Check out Sharjah below as another example of the two million club. Countless more top one million (Argentina for example, and Vietnam – see below), and still more top a half million visitors each year (example: Pakistan, which this year set a new record of 600,000 visitors). Most importantly the trend is up. Each year new records are broken. Each year more books are sold at these global book fairs. In many countries it is book fairs and festivals, not regular bookstores, where readers head to get their book fix. Imagine streets given over totally to books and literary events. That’s what’s happening in Vietnam, where a second book street opened this year and more are planned. As mentioned above, Vietnam is in the million visitors club for its book fairs. But sales are impressive too. In 2016 Vietnam’s Hanoi Book Fair sold books to the value of US$440,000. Small beer compared to the bigger Ho Chi Minh City Book Fair which sold $2.2 million worth of books during the event. A similar sum – some $2m – is the value of books sold this past year on Vietnam’s first book street. More on that in a full post to kick off the New Year. Yep, an entire city built from the ground up solely devoted to publishing. It could only happen in the UAE. And yes, I’m talking about the UAE in the deserts of the Middle East, where as we all know, Arabs don’t read and books are a waste of time. Or so conventional wisdom tells us. But since when did conventional wisdom know anything? The Casablanca Book Fair in Morocco regularly attracts 350,000. Yep, 350,000 visitors. That’s considerably more than the west’s flagship book fair, Frankfurt, pulled in this year (286,000). But 350,000 visitors pales beside the 820,000 that attended the Muscat Book Fair in Oman in 2017. Other Arab countries like Jordan and Lebanon attract, respectively, 250,000 and 180,000 visitors, while both Algeria and Egypt are in the one million club. Even Saudi Arabia is in on the act. The Riyadh Book Fair drew 375,000 visitors. Saudi Arabia held its first ever comic con this year. It wasn’t a record-breaker, but a sure sign of the times. But records were broken when 200,000 attendees confirmed New York as the word’s biggest comic con. Only to have that record snatched away by Brazil’s Sao Paulo Comic Experience, which hit 220,000. In fact comic cons boomed across the world, on every continent, with countless millions of comics, graphic novels and books changing hands in that untracked gray book market happening outside the regular bookstores, online stores and ebook stores we in the west assume is where all the book action is happening. And that’s before we start thinking about the mega-sales events. Events that are primarily focussed on selling books. The Big Bad Wolf premiered in Sri Lanka this year. Big bad what? If you’re not a regular at TNPS you can be forgiven for not knowing that the Big Bad Wolf events are the world’s largest book sales. They happened this year in Malaysia, Thailand, Indonesia and Sri Lanka, and literally millions of books are sold during these non-stop (24 hours trading) events. The Malaysia Big Bad Wolf sale this year had 4.5 million books available. A common theme in all this – and I’ve barely scratched the surface here – is that none of this is happening in the USA, and almost none of these sales are being tracked by Bowker or Nielsen or Data Guy. Just how big is the gray global book market international readers are thriving on that we in the west are largely oblivious to? It’s anyone’s guess right now, but TNPS is on a mission to find out. But here’s something to ponder: in the first three months of 2018 alone well over ten million people will be attending book fairs in places regarded as publishing backwaters (over 5 million just in India and Pakistan), and the numbers are growing every year. Another one-time publishing backwater, China, has also been making the news this year. Not just for its immense output of books and ebooks (the biggest ebook store, Tencent’s China Literature, has over ten million titles), but Tencent defines China’s 2017 publishing ambitions. Not only did Tencent achieve a $1.1 billion IPO for China Literature, but is also spread its wings globally, first with a partnership with Thailand’s Ookbee, then with Canada’s Wattpad. And at the global book-trade events, China and the UAE were ubiquitous. Not that anyone noticed, it seems, but this year’s Book Capital is Guinea Conakry in West Africa. But across the African continent interest in books and literature is growing at a faster pace than most realise, with several African book fairs attracting more visitors than their London or New York counterparts. Watch out for mots more surprise from literary Africa in 2018. It’s been quite a year for audiobooks, with US and UK publishers enjoying great success with audio versions of existing titles, and even new material especially commissioned for audio release. But while the US and UK markets have been dominated by Amazon’s Audible, elsewhere in the world other players have been doing all the running. Saudi Arabia’s Dahd, for example. But the big audiobooks story from 2017 is Sweden’s Storytel, which, far from limiting itself to Scandinavia, has opened stores as far afield as Russia and India, is currently working towards a presence in Italy and is rumoured to be looking at the UAE too. TNPS only launched in September, and I’ve not had a chance yet to look at the exciting developments in robo-writing this year. That’s something I’ll be addressing often in 2018, as one of the most daunting challenges authors will face in the next decade is having to compete with books written by machines. It’s easy, when looking at the way robots are preparing to take over other employment arenas, not least vehicle-driving, to think we writers and creatives are safe because what we do is somehow beyond a machine’s ability. Well sorry, but covering our eyes and ears just won’t do. Fortunately as 2017 closes we’re still a few years short of that scenario, so we can sit back and enjoy another improbable publishing partnership. From authorless books to driverless cars – the car manufacturer Renault, with a clearly-stated eye on the future driverless car market, became a publisher. How long , I wonder, before our driverless car narrates us the book as writes it while we sit back and enjoy the ride? This year saw three records broken in the youngest published author stakes. First, the title for youngest published author went to a four year old in the Seychelles. Then the prize for youngest published author of a bi-lingual book went to a six year old in Singapore. And then came the youngest published Arabic language author in Saudi Arabia. I began with the world’s biggest bookstore in Iran, and I’ll end this round-up with some other stunning bookstore news from 2017. While we are told e-commerce and ebooks are killing bookstores and print books in the USA, nobody seems to have told the rest of the world, where bookstores and print books are mostly doing rather well. In Myanmar more English-language bookstores are opening to meet demand, and, taking a leaf from Vietnam’s book, book streets are proving popular. But perhaps the biggest bookstore story of 2017 was in the UK. Who would have thought 2017 would be the year the failing UK bookstore chain Waterstone’s, not long ago on the brink of bankruptcy, would not only return to profitability but be rapidly expanding, with four new stores opening in December alone. This in stark contrast to the woeful tale of mismanagement that defines the USA’s biggest bookstore chain, Barnes & Noble. Not that I intended to bring the USA into this global look back on 2017, but the reference is necessary, because we need to realize that bookstores can thrive in the digital and ebook era. The UK is second only to the USA for having its book market dominated by Amazon and its retail sector being challenged by Amazon. And finally, this year ended with the largest bookstore in Bangladesh opening on December 29. Okay, not quite finally, because I still have to declare my favourite book fair banner of the year. The moment I saw the Karachi banner in the run up to the event I knew it was the winner, and as the last day of the year ticks away I’ve not changed my mind.